This entry is a twofer. This Ron Reznick photo is probably my favorite raven photograph. I've used pieces of it in various avatars. Just look at the stark black wings against that endless sky. You could almost lose yourself in that blackness. Of course, I've talked about ravens before. Raven (singular, capitalized, proper name) is a spirit that I honor. He's helped shape my life. I still depend on him. Ravens are all over mythology. And it's no wonder. The raven is intelligent with a sense of fun. Yes, they are carrion eaters and scavengers. And yes, they have strong associations with death and the slain. So of course they fill myths. Even myths you don’t expect. This is one of my favorite pieces of raven art. Again I’m not sure who did it or where I found it. But it really struck me. First of course is the line art approach. With the right subject that can really stand out. But the three legged bit, ah, that touches on mythologoical aspects. Just not the usual ones in Western Civiliation. Huggin (Thought) and Muninn (Memory? Desire? Impulse?) 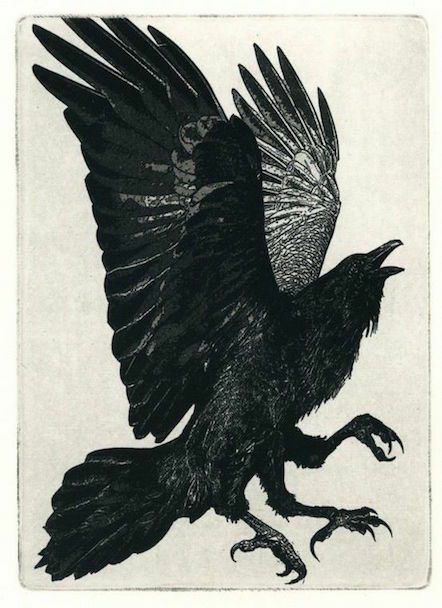 are probably the best known ravens in Western mythologies. They certainly aren’t the only ones. Native Americans have their own versions, as do the Celts. Raven is about bridging the worlds. He’s not about what you expect, he’s about showing you what is. That ties in with some of my rituals. I focus on a raven blacker than night, then I visualize myself moving through his darkness to another place. Often it shows what I need to know. These are two of my favorite raven pictures. Ravens are common in my piece of the desert. There’s one who is a regular breakfast companion. I’m proud he’s my friend.